The '53 RAF is equipped with chronometer calibre 30 SC T3-283 stem-wound, 17-jewel non-hacking movement, with special adjustment in four positions to less than 10 seconds per day (as for a chronometer). Correct hesolite crystal [click here]. A very special military issue watch and a must for every collection. This example was purchased from Ziggy Wesolowski, author of Military Timepieces, and in mint condition. Amazing survivor. Unitas Swiss-made wristwatch in a 33mm solid nickel hinged back case. Wire lugs with what looks like the original charcoal-gray leather strap. Porcelain dial with some chips and crack as you might expect on a watch almost 80 years old. During the war and the time leading up to the war there was a lot of competition among goverments for access to Swiss timepieces because they were the best available and produced in significant quantities. The movement runs strong [click here]. 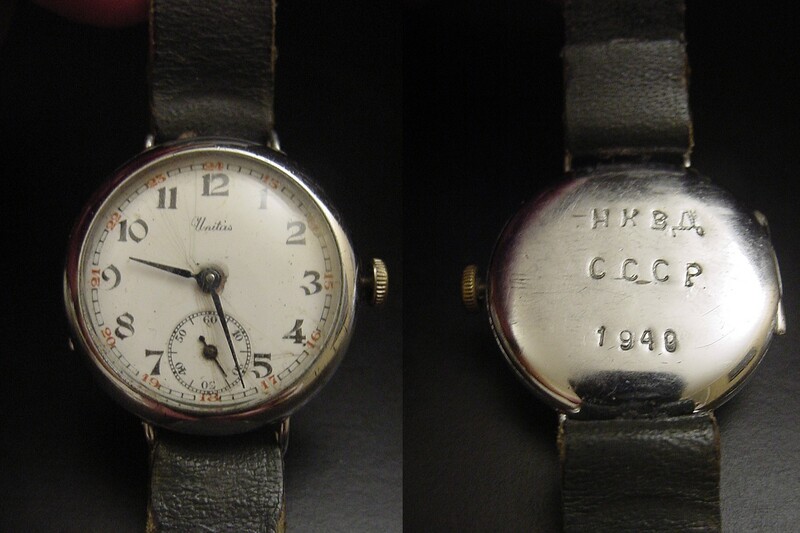 The back is stamped CCCP (Cyrillic acronym for USSR) and 1940. The Cyrillic letters above that translate in English to NKVD (Narodny kommissariat vnutrennikh del), Stalin's secret security police that eventually became the KGB. A cool piece of history for the serious collector. After WWII, many watches procured during the war were retained in service. 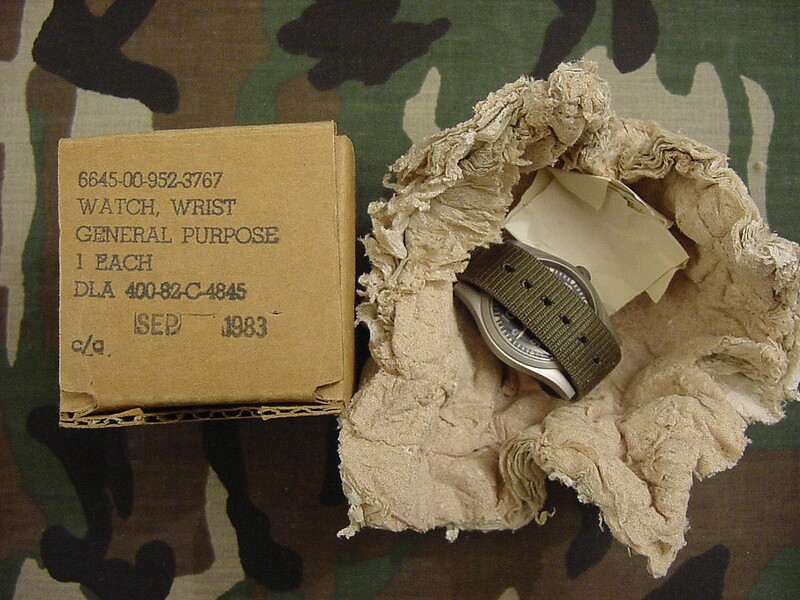 Many of the ORDNANCE DEPARTMENT subsecond watches were recased from base metal cases to stainless steel cases with a dull, phosphate finish (caller Parkerized). Stainless steel was a strategic metal during the war but was readily available afterwards. 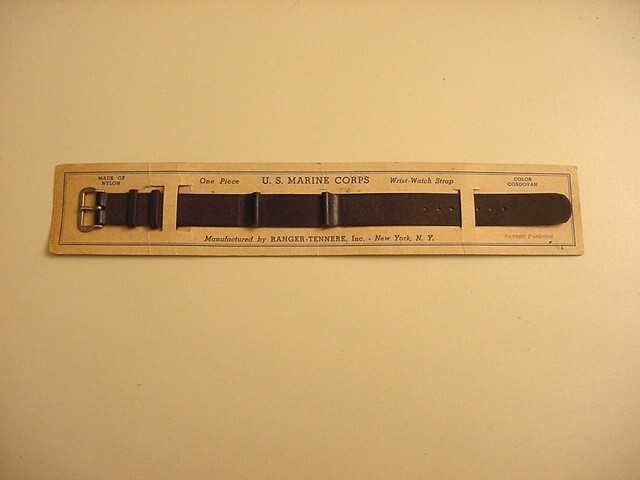 Marines were issued watches during the war, probably made to USN/BuAero spec. This included watches made by Elgin, Hamilton and Waltham. 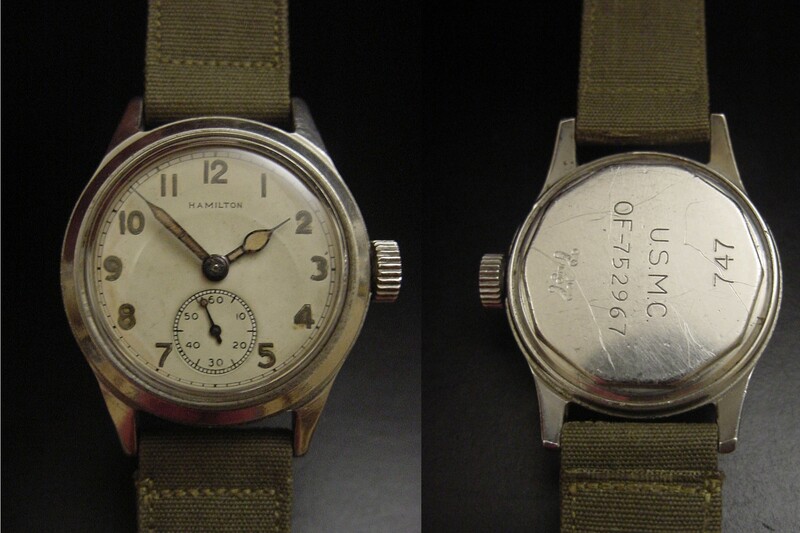 But it wasn't until the 50's that Hamilton produced watches specifically to Marine Corp specs and were marked USMC. Like this example, the Keystone cases were stainless steel with screw backs and housed the new caliber 747 17-jewel movement [click here] that replaced the wartime 987A. The dial had luminous hands and numerals and the subsecond hand was tipped with a luminous dot! This is a beautiful issued example, all original except for a modern crystal. The 2-piece NOS canvas strap is 40's vintage. 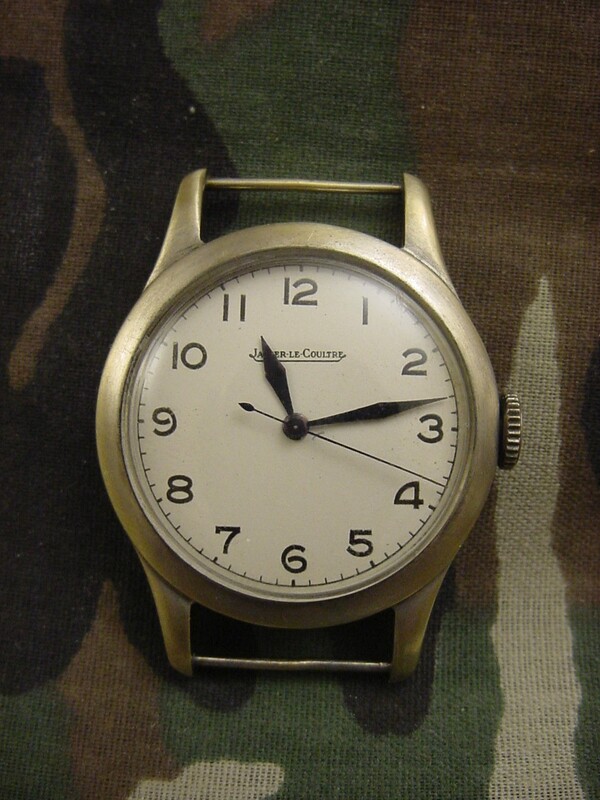 Although the small firm of Ollech & Wajs of Zürich, Switzerland, never really produced contract watches for any military, the company designed many of its models around military needs. It sold its watches through a mail-order leaflet, primarily to American GI's serving in Vietnam with whom they were very popular [click here]. The O & W Early Bird model was first introduced in 1965 and named after the world's first commercial communications satellite (COMSAT). It's a simple, rugged 24hr watch with the ability to tell a second time zone. The watch uses the 17-jewel manual wind FHF Cal. 72 movement and the stainless steel case is 38mm wide (including the bezel) and 11mm thick. Lug width is 19mm. The water resistance rating is 20ATM [click here]. The dial of this watch is immaculate with a light patina on the hands and markers. The blue/red bezel is vibrant and shows very little wear. The case is excellent with only a few edge marks. Overall this watch is easily near mint. [click here] You would be hard pressed to find a finer example. A marine chronometer is a precise, accurate timepiece that can be used to determine a ship's longitude. To locate one's position on the earth's surface, one needs to know one's north-south coordinate (lattitude) and east-west coordinate (longitude). For centuries, sailors had a number of celestial techniques to accurately determine their lattitude. But there was no way to determing where they were on that east-west line. Dead reckoning was the method used most often by sailors to "guesstimate" distance traveled but it was notoriously inaccurate. Prior to the development of chronometers in the mid-eighteenth century, ships at sea were pretty much lost once they left sight of land. Yes, you would eventually arrive at your destination but your ship might be destroyed against a rocky shore in the middle of the night since you didn't know how close you were to making landfall. How do you ration food and water if you don't know when you will reach land -- tomorrow or a week from now? This problem was responsible for so much loss of life and destruction of ships that the English Parliment passed the Longitude Act in 1714 establishing a Longitude Board to provide monitary rewards to anyone who could devise a simple, consistent method of determining longitude. The marine chronometer, which solved the problem, was a huge technical achievement in its time and the life-long work of an English tinkerer/craftsman, John Harrison, with no formal training in making clocks -- a fascinating story in itself. Ziggy Wesolowski in Military Timepieces calls the quest for an accurate naval chronometer the Genesis story of the military timepiece. To determine one's longitude, ships first had to synchronize their chronometers when they set sail to a standard time at the Royal Observatory in Greenwich England at Longitude zero. While at sea, the navigator could compare local time (using a sextant and the sun's position) with the time at zero longitude (Greenwich time) and convert the time difference into distance from zero longitude. But with GPS devices, who needs chronometers? Your GPS tells you exactly where you are anywhere in the world. The US Naval Academy in Annapolis, MD, has recently returned celestial navigation to the curriculum. In a serious conflict between superpowers, destroying the enemy's navigational satellites will be an early strategic objective. Without the satellites, your GPS becomes a paperweight. The Swiss company, Ulysse Nardin, has been making fine timepieces since 1846 and this watch commemorates their achievements in marine chronometers. 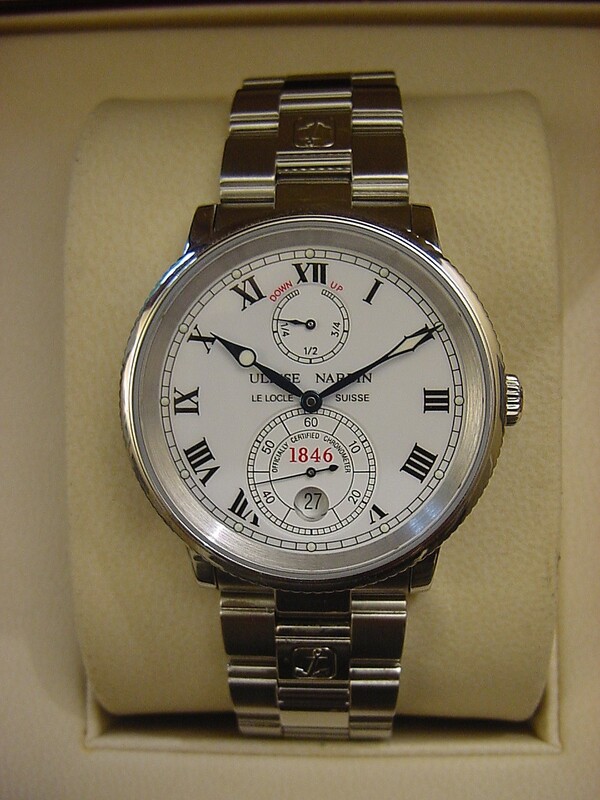 There are several versions of this watch (white dials, blue dials, Arabic numerals and Roman numerals) but the white dial with Roman numerals is the most desirable since it most resembles the original boxed chronometer [click here]. Listed on the titanium back [click here] are the 18 gold medals that Ulysse Nardin marine chronometers have won in world-wide competitions. Each numbered watch is crafted from 316L stainless steel, 38mm in diameter with a screw-down crown, water resistant to 200m [click here]. The high-grade, self-winding, hacking movement has 28 jewels and oscillates at 28000/hr (4hz). The dial has an up-down indicator that shows the winding reserve of the mainspring. When fully wound the watch will run for 42 hrs. The crystal is sapphire [click here]. The beautiful screwed-link bracelet is very comfortable and has all links. This watch has just returned from the Ulysse Nardin Factory Service Center in Boca Ratton, Florida, where the movement was disassembled, cleaned, lubricated, and regulated. It keeps excellent time. The case and bracelet were polished and the watch looks like new. Comes with the Ulysse Nardin 1-year factory warranty, the original inner and outer boxes, instructions and polishing cloth [click here]. A stunning watch and you won't find a nicer example. 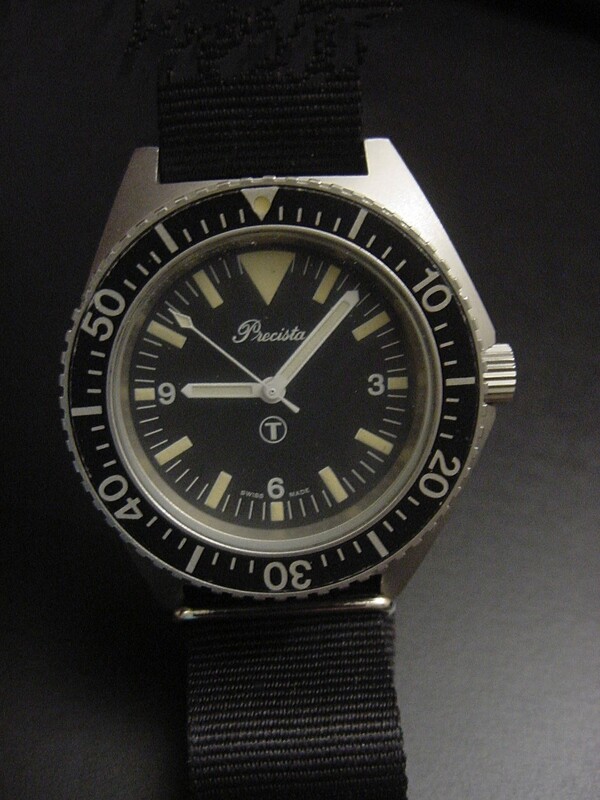 This Precista was issued in 1993 and fully marked on the back [click here]. The quartz movement has a fresh battery and is working well. Beautiful patina on the dial markers and hands. A slight ding on the bezel at 10 o'clock but it otherwise shows very light wear [click here]. The bead-blasted stainless steel case is 43mm wide (including screw-down crown) and 12mm thick. Flat mineral crystal. 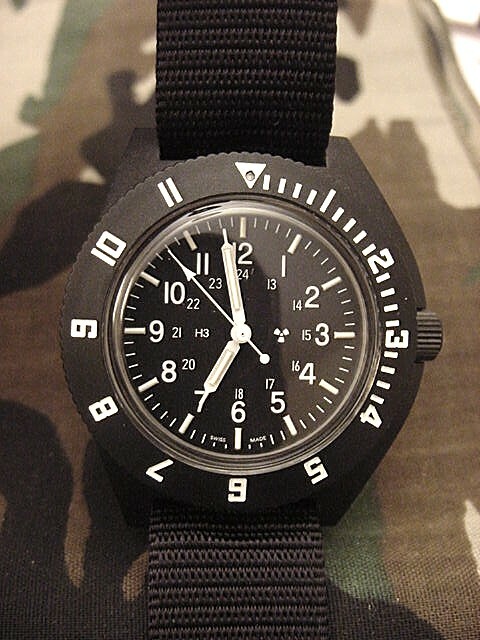 Comes with a black nylon NATO-style strap. Rare to find these watches in this condition. This Hamilton 6b is often described as the "poor man's" version of the famous IWC and JLC Mk-XI watches. [click here]. Excellent 36mm brushed stainless case. Very clean Hamilton S75S hacking movement [click here] with spring retainer and dust cover -- an excellent movement but not chronometer grade as in the Mk-XI spec. Gray NATO 18mm strap. Keeps good time but service history unknown. There were 2 versions of the Hamilton 6b wristwatch. 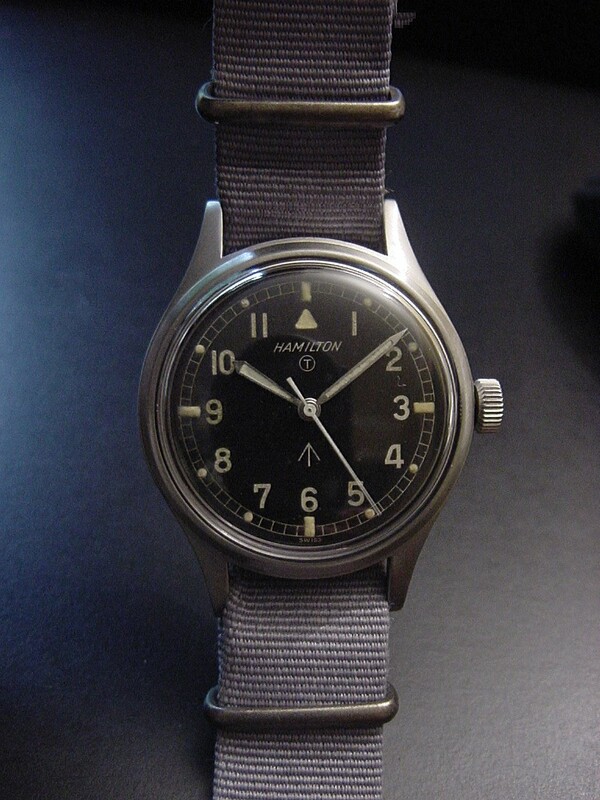 The first model was the 6B-9101000 and had the Hamilton non-hacking 75s movement. The later model had the reworked, hacking s75s movement. This example is the later model watch but with the earlier back [click here]! Happens with mil watches. But otherwise original and correct. Gray NATO 18mm strap. Keeps good time but service history unknown. Great everyday watch! These watches by Omega were issued by the RAF in only one year, 1953, and, thus, are often referred to as the Omega 53 [click here]. There were several dial variations. The earliest radium dials had the Ministry of Defense property mark -- the broadarrow -- printed above the 6 in a thin font. These were returned to Omega for tritium dials when it became known that stockpiles of radium watches could be hazardous. The replaced dials had a thicker broadarow and are referred to as "fat arrow" dials. FA 53's are typically the ones you find for sale. 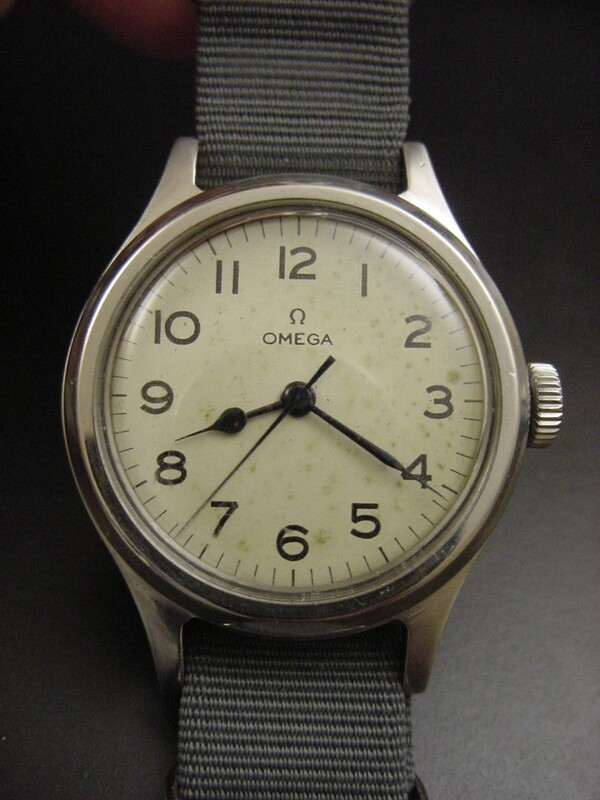 However, some watches sent to Omega returned with the thin arrows (TA's) but now had tritium as the luminous material. This is one of those watches and highly sought-after by collectors. 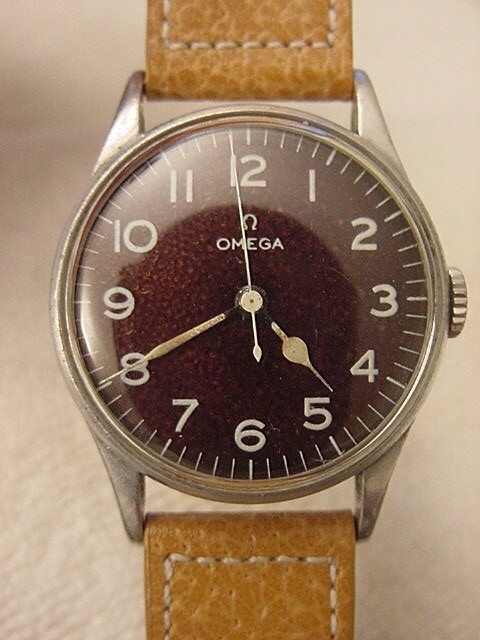 At one time you could send your FA 53 to Omega and have the dial replaced with a new TA dial. Unfortunately, these TA dials are no longer available from Omega. Original and correct Omega Cal 283 17-jewel shock-protected hacking movement [click here] with tensioning ring and dust cover. Robust brushed stainless steel, screw-back case (what Omega calls Staybrite) approximately 37mm in diameter and 13.5mm thick. 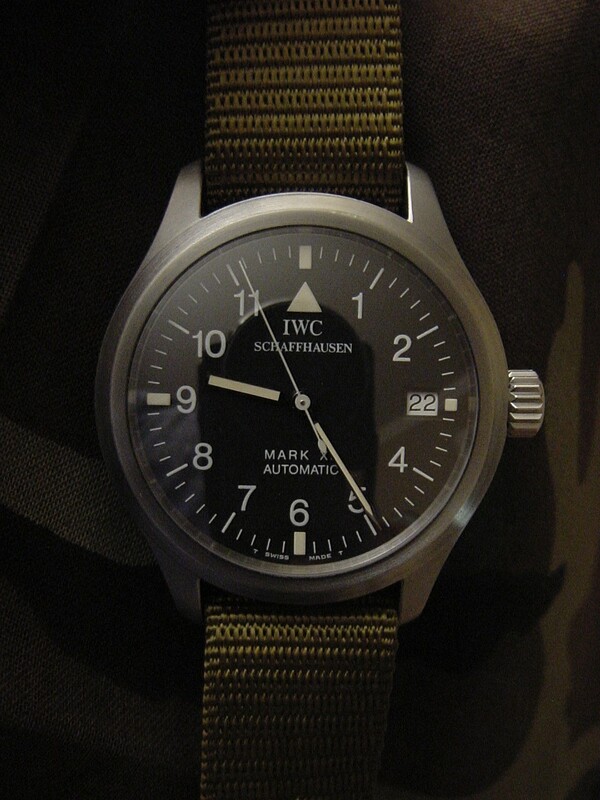 Comes with an 18mm NATO-style strap. [click here] Rarely come up for sale! 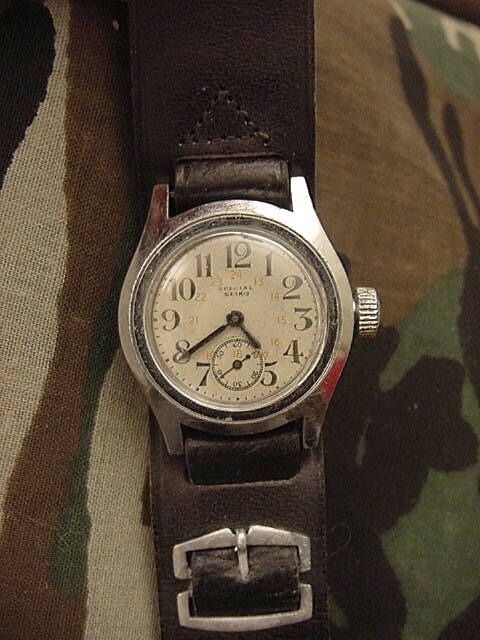 Rare JLC Air Ministry pilot's watch issued in 1943. The 32mm snap-back brass case is stunning. Beautiful original cream-colored dial and distinctive JLC blued-steel hands. Fully-marked stainless steel back [click here]. Gold washed JLC movement [click here]. Fixed lugs. Original crown. Comes with a period 16mm fabric strap [click here]. Amazing condition for a watch over 70 years old! Highly collectable. 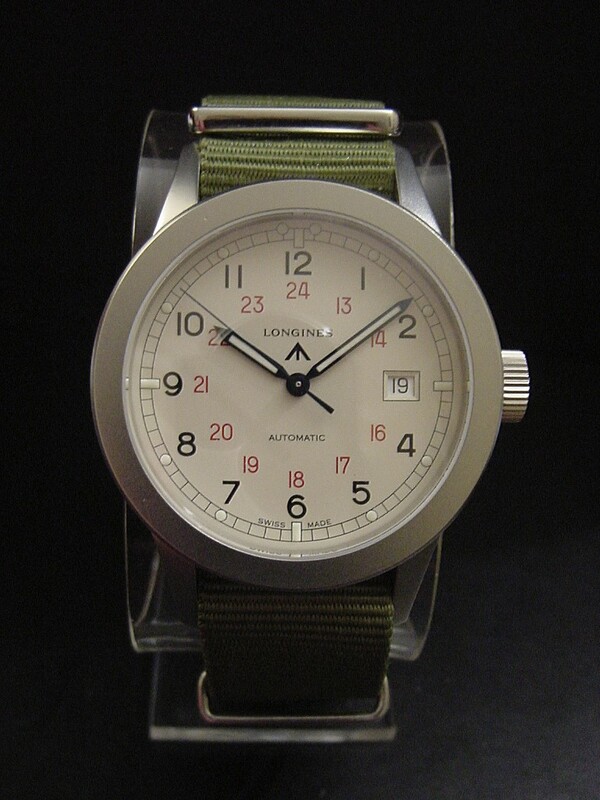 The Longines Heritage Military COSD is based on a piece of equipment created by the British Special Forces in 1944. Each item of this equipment was marked with the initials COSD and intended for the sole use of the Combined Operations Command created by the British War Office during WWII. These special watches were to be issued to paratroopers (although most were not ready for Operation Overlord nor Operation Market Garden, according to Ziggy Wesolowski in Military Timepieces). Ordinary wristwatches could not always be relied upon to withstand the opening shock and landing impact stresses imposed upon them during a parachute descent. The 40 mm stainless-steel screw-back case [click here] houses an L619.2 automatic movement. The polished case has been bead-blasted like the original issue watch. Very comfortable on the wrist. The stunning opaline dial boasts a railway-track minute ring with large black Arabic numerals as well as a red 24-hour scale enhanced with blued hands. The crystal is double-domed sapphire. The Longines Heritage COSD is remarkably faithful to the original COSD issue watch [click here] [click here]. Included are the inner and outer boxes, instruction booklet, the unworn Longines leather strap that came with the watch and original warranty card [click here] [click here]. Original list price was $1900; no longer in production and hard to find. Excellent everyday watch. A significant contribution to the demise of the German U-boats was the development of what we today call SONAR (SOund NAvigation and Ranging). Late in WWI it was called ASDIC and it was the most important military innovation in the war. Using sound waves to detect and track submarines by the Anti Submarine Division was top secret stuff at the time. Churchill made a slip in the House of Commons when he mentioned ASD's (pronounced ASDics) work. So, to cover the slip, the name was quickly contrived to become Allied Submarine Detection Investigation Committee or sometimes Anti-submarine Detection Investigation Committee although no such committees actually existed. At any rate, this stopwatch could be used to determine the range to target. Sound passes through seawater at the speed of approximately 1,650 yards per second (depending on temperature, among other things). One started the timer on hearing the "ping". The sound wave travels out, strikes the target and is reflected back. The stopwatch is stopped when the return "ping" is heard and the distance to target can be read from the scale. 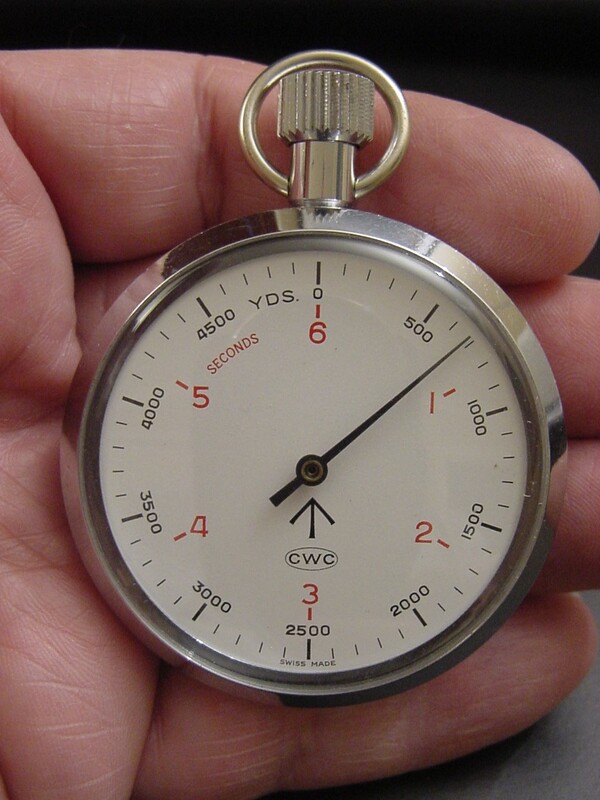 The timer is calibrated to one-half the speed of sound in seawater (one second on the dial shows a distance of approximately 830 yards) since the sound wave goes to the target and back, twice the distance to the target. Chrome base-metal case 51mm in diameter. A real piece of military history, fully marked [click here], working and in mint condition. These watches look more like the Mk XI's than the later Smiths 6b watches with which we are all familiar. It is believed that fewer than a thousand of these were produced for the British armed forces! The stainless steel case is 36mm in diameter and the original radium dial and hands were MOD replaced with tritium versions. The back [click here] is marked 1955. The 17-jewel movement [click here] [click here] has a frosted gilt finish. Comes with a 18mm gray NATO strap. A rare collectible piece! 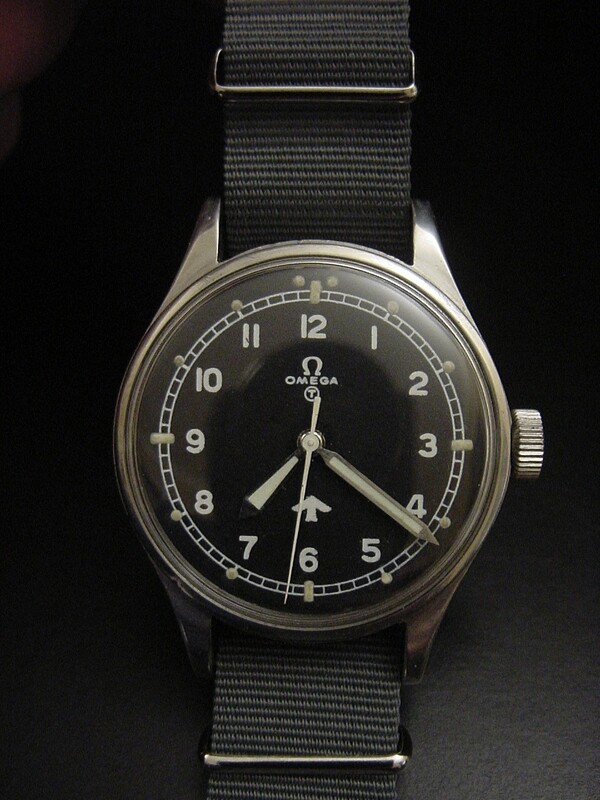 In 1956, the British Ministry of Defense modified existing stocks of the war-time Omega pilot/navigator wristwatches. The 1943 Omegas had workhorse, chronometer-rated 30t2 SC movements but in inexpensive, snap-back plated alloy cases. These excellent movements were fitted with new dials and stunning stainless steel, screw-back Dennison cases in the style of the Mk11. Most 1956 Omegas have black dials and the distinctive spade hands coated with luminous material. Some, like this current example, had white dials with beautiful blued-steel hands [click here]. The 36mm screw-back case is fully marked [click here]. Original crown and crystal. Comes with a NATO issue strap. The movement has been serviced and runs great. Can be a distinctive every-day watch! One of the earliest watches made for issue to pilots and navigators. It was manufactured to the original MIL-27834 specification. (WWII USAAF A-ll watches were made to revised specs starting in 1943 -- MIL-27834B). The USAAC Type A-11 was approved for issue on August 8, 1937. The Weems Patent second setting watch allowed the wearer to synchronize their timepiece to a correct time source. This was accomplished via the locking 60-minute bezel. To set the watch to the exact second of GCT (Greenwich Civil Time), the seconds bezel was rotated, keeping the 60-second graduation continuously under the sweep second hand. When the Greenwich radio time "tick" or signal which breaks at the 59th second and resumes on the 60th second was heard, the turning of the bezel was stopped. The watch then indicated the exact second of GCT (from Whitney's Military Timepieces). Lieutenant Commander Phillip Van Horn Weems taught Aerial Navigation at the US Naval Academy in Annapolis, Maryland. His system of navigation was used not only by the military but also by Charles Lindbergh, Admiral Richard Byrd and many other noted flyers and explorers. 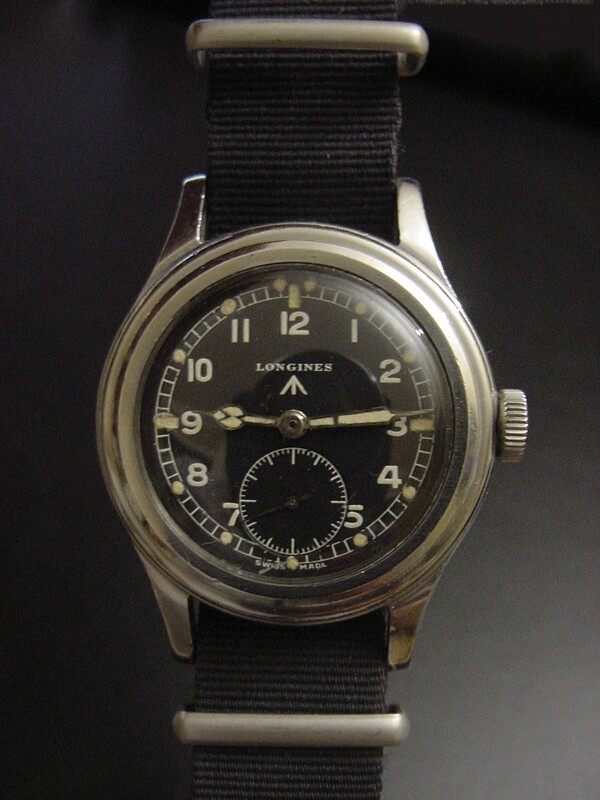 This Longines USAAC watch has full military markings [click here] -- even the movement is marked [click here]. 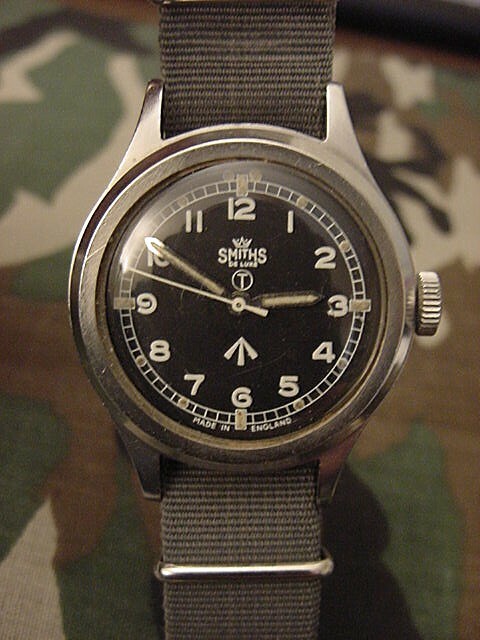 Unmarked Longines Weems watches that one typically finds were sold for civilian use. The contract date on the back is 1940. Another view [click here]. The Longines Weems is a small watch by today's standards.The case is 27.5 mm in diameter and made of plated base metal. Blued steel hands. The strap is a NOS WWII vintage green canvas issue strap -- almost as rare as the watch [click here]. The 10L movement with gold jewel settings has been fully serviced and keeps good time [click here]. The overall condition is excellent. 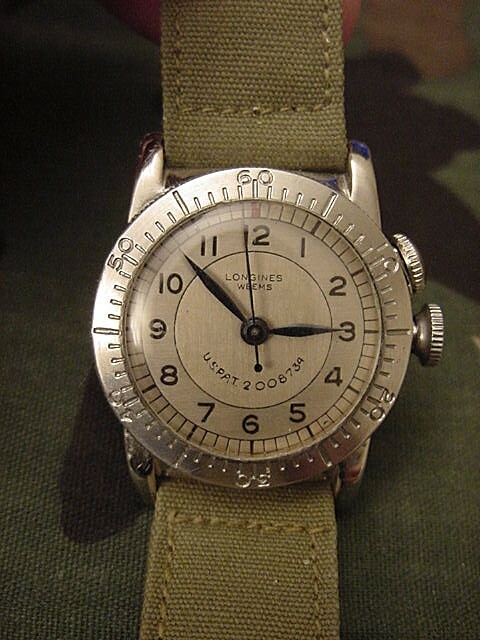 The Longines WWW (wrist watch waterproof) is probably the most famous of the British military watches. It derives its name from the often-cited belief that it was developed for the British North Greenland Expedition of 1952-54. But there is some doubt that this is true. But the Longines was a rugged watch and no doubt up to the task. It was one of the few WWW's that had a stainless steel case [click here] [click here]. The cathedral hands and dial are beautiful. At 38mm it is the largest of the WWW's and very wearable. Fully marked back [click here]. The numbers on the case back match the number on the back of the lug. The 15-jewel movement is a refined version of the 12.68Z and fitted with a shock resistance system [click here]. The movement winds smoothly and runs strong but service history is unknown. Like the Longines D-Day "tuna can" watch, the crystal is installed through the back of the case and a retaining ring screws in, pressing the flanged crystal into a gasket. Cool! Comes with a NATO style band. All original and correct. As nice an example as you will find! One of the more popular pilot watches, the IWC Mark XII is the modern, automatic version of the classic RAF pilot's watch, the Mk11 in mint condition. The stainless steel brushed screw-back case measures 36mm in diameter. Water resistant to 30 meters with an iron core to provide an anti-magnetic screen. It has a signed screw down crown and domed sapphire crystal [click here]. The matte black dial has Arabic numerals and quickset date at three. The tritium markers and hands show a beautiful patina. This watch comes with the very comfortable RIOS1931 buffalo strap with signed IWC buckle [click here]. Other views: [click here] [click here] [click here]. The IWC Mark XII movement is based on the Jaeger LeCoultre 889/2 with 36 jewels with a vibrating speed of 28,800 vph -- one of the finest automatics manufactured even by today's standards and arguably one of the highest quality watches IWC ever made. Originally retailed for $6,000. Recently overhauled by Superior Watch, the official IWC factory service center and comes with their 1-year warranty. Includes the IWC box [click here] and OD issue strap [click here]. 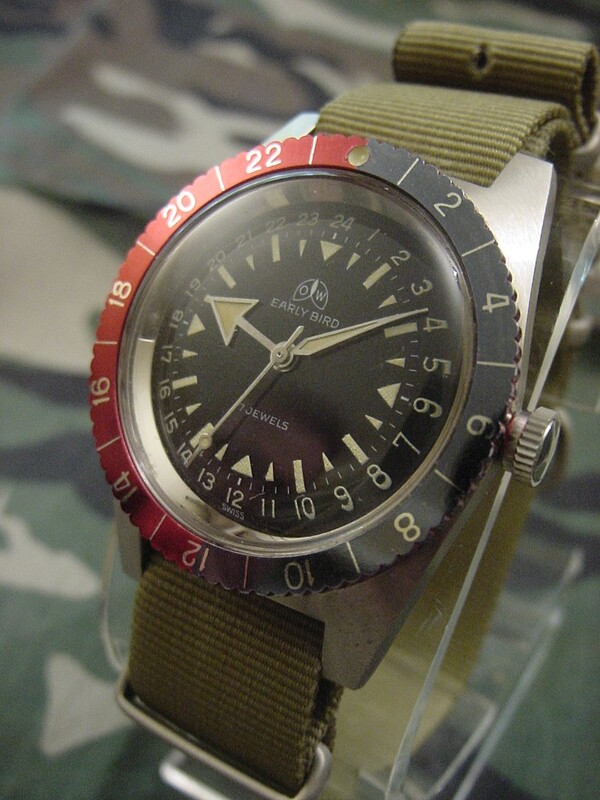 Superb watch with that vintage military look! These watches were issued to German troop fighting in Afghanistan. They were made by Boccia, a sister company of Tutima, in solid titanium [click here]. The screwback case [click here} is 39mm in diameter and 11mm thick. Perfect flat sapphire crystal. The chronograph movement is a Myiota T250. Functions include analog and digital time; alarm; stopwatch and date. Comes with the black nylon NATO strap shown and instructions. Very light wear. Perfect everyday watch and very collectable. Another part that's impossible to find -- the dust cover for the IWC Mk II British RAF watch. These are made of soft iron to supress magnetic fields and consequently rusted if water entered the case. In excellent confition. These nylon watch straps are often seen on the Elgin and Hamilton canteen watches since the canvas straps tended to rot rather quickly. Also used in jungle fighting for the same reason. The strap fits the 16mm lugs of the WWII-era watches perfectly [click here]. I have several, new in their original packaging. Stainless steel buckle [click here]. Color is cordovan [click here]. Rarely see these for sale. The MIL-W-46374 specification for watches provided for a basic, inexpensive, non-maintainable, non-hacking, general purpose timepiece. When the "D' revision came out it completely changed the nature and scope of the MIL-W-46374 spec. 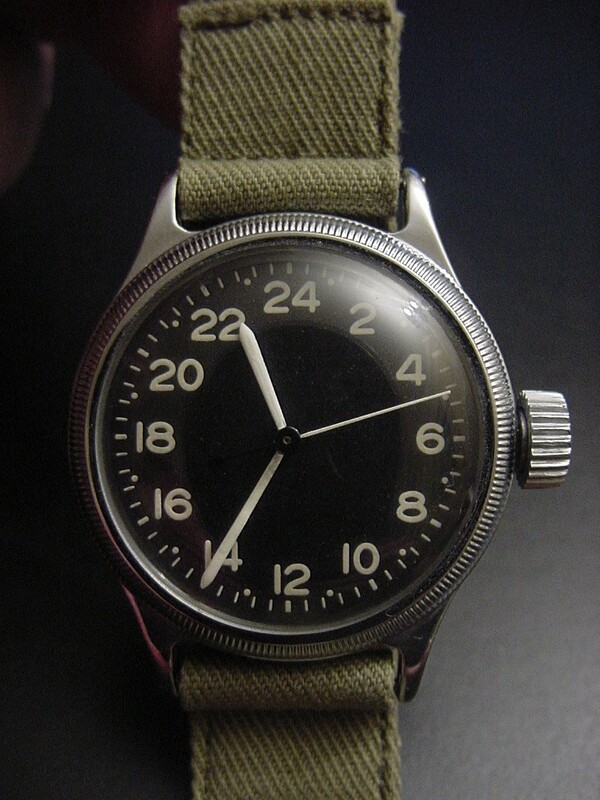 This is a Hamilton US Army watch marked MIL-W-46374D and only issued in 1988. It's among the last wristwatches Hamilton produced for the military. It's a manual wind wristwatch, 33mm x 41mm to lug tips, with a matte stainless steel screw back case [click here]. Original black 24 hour dial with radioactive and H3 symbols. The movement (unlike the 7-jewel movements in the common "B" watches) is a hacking, high-quality 17-jewel ETA cal 2801-1 with precision ETACHRON regulator, and a quick-train at 28,000 VPH (4 Hz). [click here] (stock photo). Probably the best quality modern US issue watch. The movement has been completely serviced and it comes with a genuine OD issue strap. Great everyday watch and very collectable. These Seiko chronographs were issued to RAF pilots and navigators in the 80's through the 90's and replaced the Valjoux 7733-based stem-wound chronographs. The 7A28 was the very first quartz chronograph with an all-analog dial. This legendary movement has 15 jewels and all metal gears-- no plastic parts. The matte stainless-steel case is 38mm in diameter and 10mm thick. Fully marked on the back [click here]. Fixed bars. Over 11,000 were issued between 1984 and 1990. A separate stepper motor is provided for each indicating function, and the button at 10 o'clock temporarily stops the chronograph hands' motion as actual timing continues, providing a "split-second" function. While the main chrono-seconds hand moves with the press of the button at 2 o'clock at the typical quartz once/second, the hand within the subdial at 3 o'clock races along at a most entertaining 20 steps per second, (although it is labeled "1/10s"). The register at 9 records the elapsed time up to 30 minutes. Constant seconds are indicated at the 6 o'clock register. All gaskets (caseback, crystal, crown and pushers) have been replaced. New correct genuine Seiko hardlex cyrstal. Light wear on the case as you would expect with an issue piece. Comes with the mil-issue strap shown [click here] and instructions! One of my very favorite military watches! Japanese military watches are the most difficult to find in good condition (and sometimes in ANY condition!) because so many did not survive the war. Those that did typically came home with servicemen. 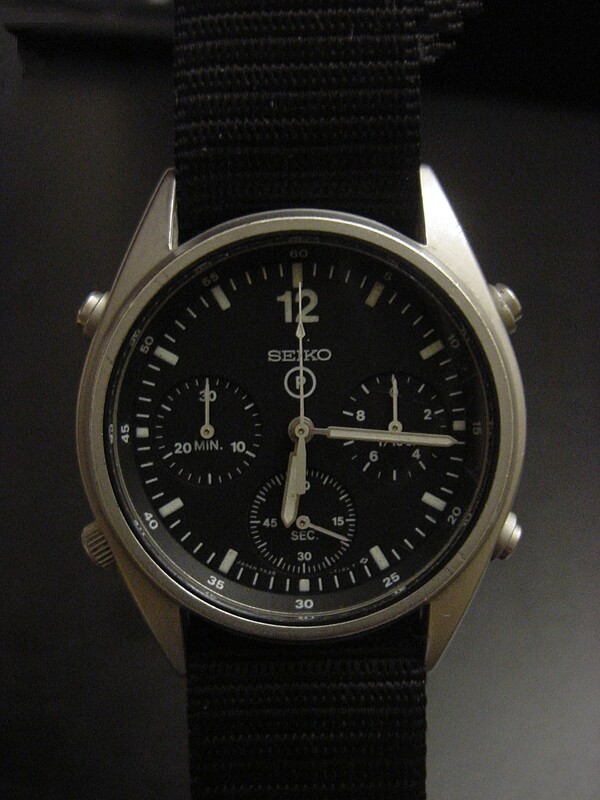 This example was made by Seiko and has a Seikosha-signed movement that winds smoothly and runs well [click here]. It's a double-cased watch, an attempt to protect the watch from the elements [click here] and tiny by today's standards at 31mm [click here]. The case is chrome-plated base metal with a stainless steel back [click here]. Fixed lugs. Dial signed "Special Seiko" with military time in red. Nicely aged and (except for the front crystal that looks modern) original and correct. Includes an black leather unworn, strap that's correct for this watch [click here]. Some light oxidation on the strap hardware. A piece that every mil watch collection should have. Longines high-grade navigational chronograph features a 50mm nickel case with inner dust cover and porcelain dial. Some very fine cracks in the porcelain. The 17-jewel signed Longines movement is stunning [click here]. 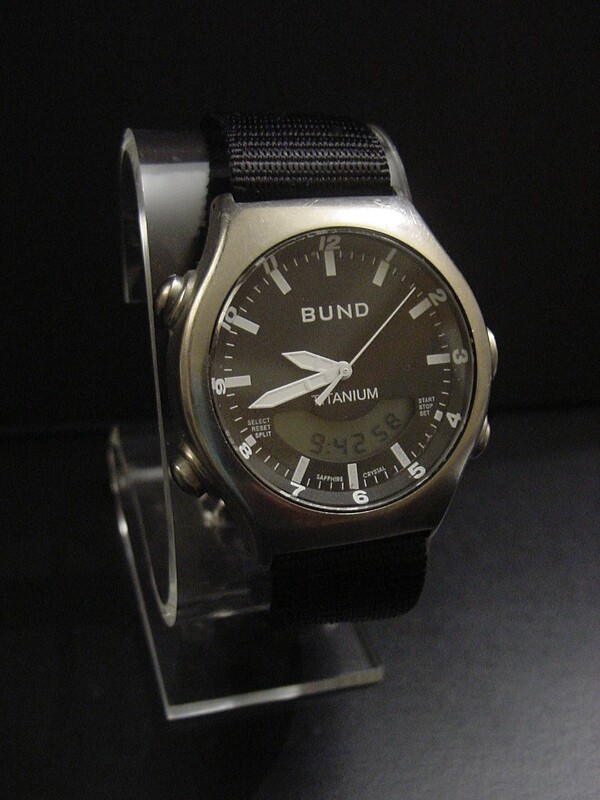 The Kanji markings on the back [click here] identify it as a luminous watch and includes a serial number 4301. The watch is running strong and all chronograph functions work properly. It originally came from the estate of a WWII veteran. Includes a glass dome display. A rare and beautiful watch. This Hamilton was made to the MIL-W-46374 specification and has a 7-jewel ETA hand-wound movement. It's dated July 1983 on the back [click here]. These watches were designed to be disposable and the back is marked "Dispose Rad Waste." Matte 32mm stainless steel case [click here]. This example is unworn and with the original issue box. Just the way it was delivered to the US Army. Over 30 years old! Very collectable. 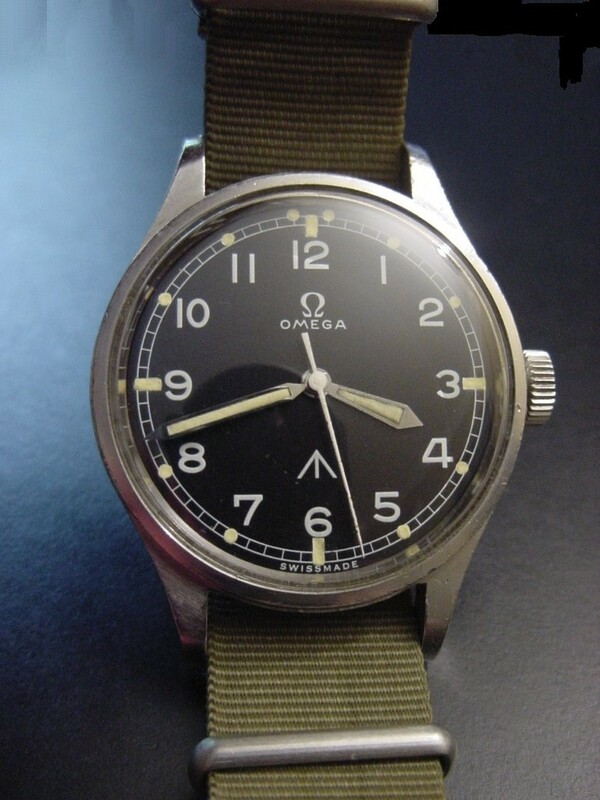 Rare Omega HS8 marked Fleet Air Arm pilot's watch [click here]. These were almost identical to the RAF version (6B). 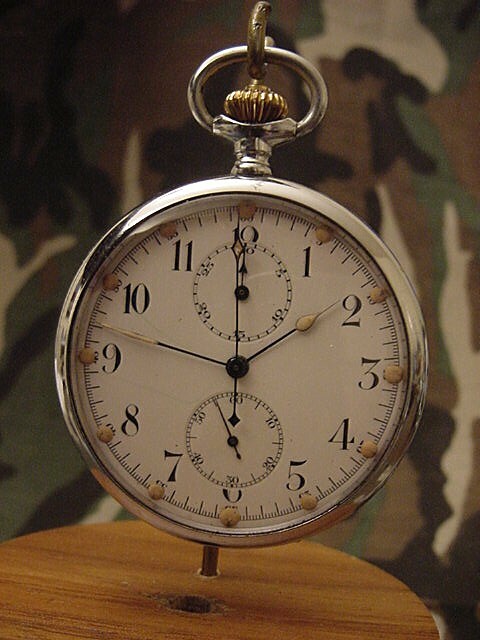 According to Wesolowski's Military Timepieces, the earlier models had spring bars and a plated brass case while after 1942, to save money, they used the same alloy case and fixed bars as the 6B. This watch is the later version. Very clean 16-jewel movement [click here] runs good. The dial has a maroon, pebbly look when viewed up close. Originally purchased from FinerTimes. With a nice pigskin strap. This SandY model 590 is genuine military issue, made to military spec MIL-W-46374F Type 3 [click here]. It features a Ronda Swiss-made jeweled quartz movement with quick change date and hacking feature. The39x39 mm black case is made of an extremely durable nylon/fiberglass composite material and the crystal is hardened mineral glass with aluminum bezel. 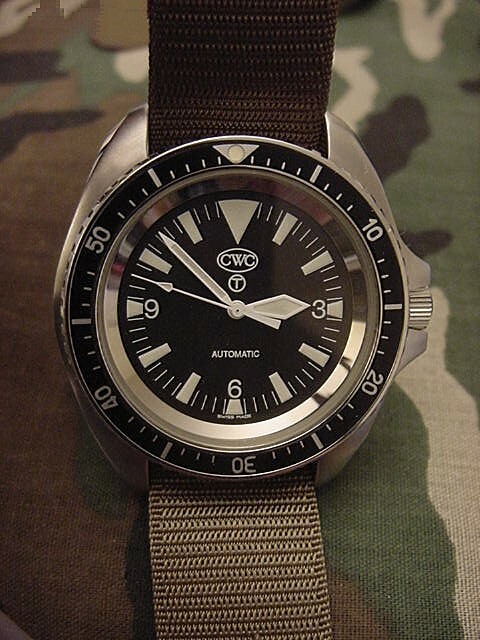 This type of watch was used extensively in the Gulf War. 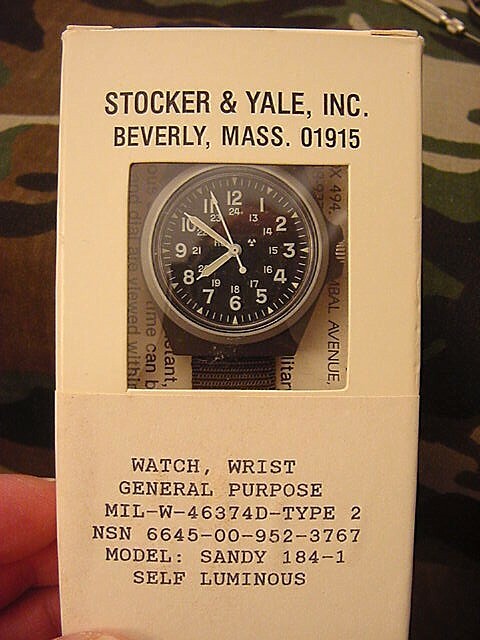 Stocker & Yale no longer produces military watches. In excellent condition with a NEW Ronda 715 movement and new black nylon Maratac strap. Great everyday watch! Last one! NIB U.S. Military Navigator's Watch, dated June 2012. The asymetrical nylon/fiberglass composite case is almost 33mm in diameter and 13mm thick, water resistant to 6 ATM [click here]. 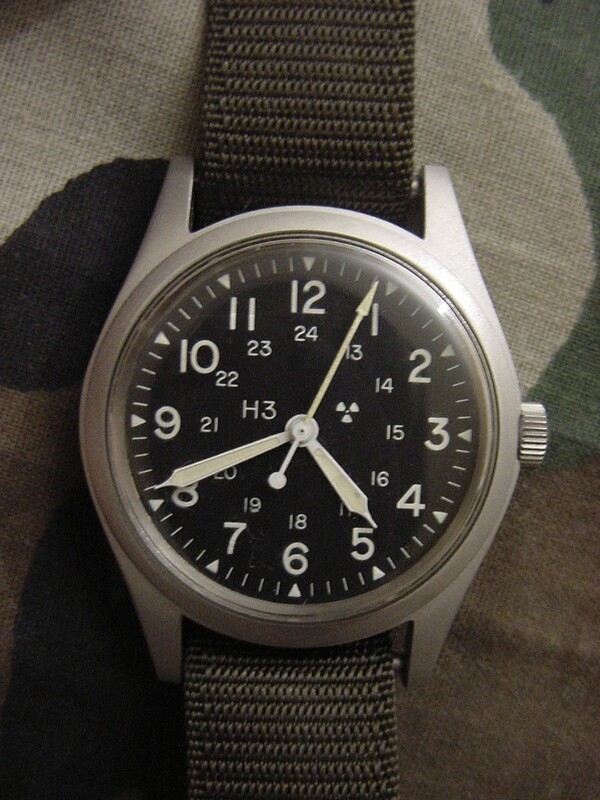 This Type III Class 1 issue watch is made to the latest MIL-PRF-46374G spec. High quality, hacking Swiss-made quartz movement. Tritium-tube hands and markers. Hesolite crystal. It is designed for accuracy at high altitude to 35,000 FT without compensating pressurization. The rotating bi-directional outer bezel provides marking for a second time zone. The stainless steel back has full military markings [click here]. Comes with black nylon flight strap and strap-mounted compass. Great everyday watch. CWC (Cabot Watch Company) has made watches for the British Ministry of Defense for over 30 years and their automatic diver's watch has been made to exacting MOD specs. It was issued for approximately one year and replaced the Rolex Submariner Automatic in the early 80s. It was then replaced by the CWC RN quartz divers' watch, which is still in current service today with Royal Navy divers. Swiss mechanical hacking auto movement, water-resistant to 300 metres, tritium luminous markers. Fixed bars. NATO stores numbers and broadarrow on back [click here]. On new OD strap. With original box and papers. Looks unworn and keeps excellent time. Currently over $800 at Silverman's. This is a rare Wehrmacht issue watch. The outstanding dial is marked "Etanche" and, under that "77" (perhaps a reference to the movement). It's a small watch, only 29mm in diameter, but the case is not brass or stainless steel but an aluminum alloy! Knirim in his reference book on military timepieces suggests that this may have been issued to women (Damenuhr)! 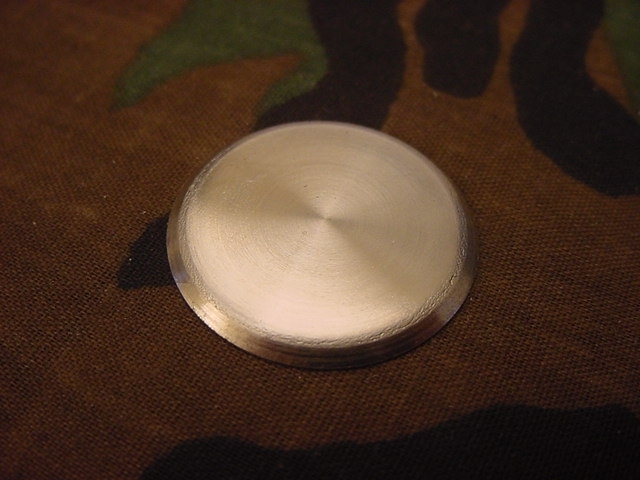 The stainless steel snap-back is DH marked [click here]. Running and all original. Includes a cotton canvas band that's the correct vintage but not original to the watch. The SandY model 184-1 was made to mil spec MIL-W-46374 D and meets the requirements for a Type 2 designation. It has a non-hacking 17-jewel movement [click here] (pic is from another 184-1) and has never been worn. Fully marked back [click here]. In original box with papers. NIB issue watches are really special for collectors. 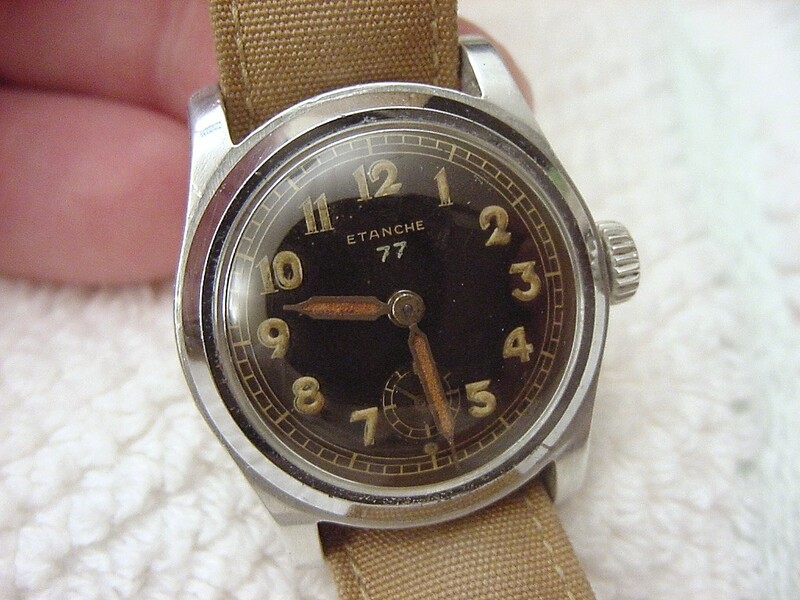 This watch has an Elgin true-24hr grade 729 18-jewel adjusted movement [click here]. Stunning black dial. It's housed in a 31mm NOS 3-piece stainless steel screw-back case with a coin-edge bezel. [click here] No, it's not the elusive A-12. Watches such as these were never issued as wristwatches in WWII but were made from instrument watches -- like those used in wing cameras to document the action and, hopefully, a kill. Some are found in ordinance cases and some in A-11 cases (like the current example). But a cool piece nonetheless. Comes with a vintage NOS Elgin signed tan canvas band.